Spirituality scholars reflect on those prayers, biblical quotations and Christian texts which we know by heart, how they have influenced faith and what they have to say to us today. The book draws on the Protestant, Catholic and orthodox traditions. - Publisher Major academics working on spirituality reflect on their responses to the key texts of Christian spirituality. This collection aims to cover the most familiar texts, and takes in both the Old and New Testaments as well as the Catholic and Protestant traditions. Its purpose is to explore the use, influence, and impact of these texts--often known by heart and influential beyond the faith community--and to look at how they shape our faith. Joy of Heaven will combine high-caliber academic writing with a more personal warmth. 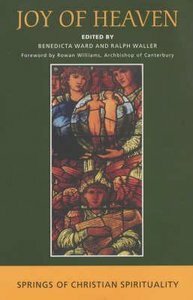 Contributors include: Santha Battacharji, David Moss, Gordon Mursell, Jeremy Sheehy, Colin Thompson, Ralph Waller, Benedicta Ward, Kallistos Ware, Richard Watson, and Edward Yarnold. Major academics working on spirituality reflect on their responses to the key texts of Christian spirituality. This collection aims to cover the most familiar texts, and takes in both the Old and New Testaments as well as the Catholic and Protestant traditions. Its purpose is to explore the use, influence, and impact of these texts--often known by heart and influential beyond the faith community--and to look at how they shape our faith. Joy of Heaven will combine high-caliber academic writing with a more personal warmth. Contributors include: Santha Battacharji, David Moss, Gordon Mursell, Jeremy Sheehy, Colin Thompson, Ralph Waller, Benedicta Ward, Kallistos Ware, Richard Watson, and Edward Yarnold. Benedicta Ward is Reader in the History of Christian Spirituality at the University of Oxford. Waller, a Methodist minister and a leading authority on the Wesleys and the 19th century Nonconformists, is Principal of Harris Manchester College, Oxford.